Philippine government assures its people that everything is prepared as typhoon Chedeng enters the Philippine Area of Responsibility. Typhoon Chedeng is expected to enter PAR and affect Luzon during the Lenten Season. Secretary Edwin Lacierda, Presidential spokesperson said that National Disaster Risk Reduction and Management Council (NDRRMC) and its attached units are all ready and prepared for the upcoming typhoon. On the other hand canada and United Kingdom released statements and separate advisories for their nationals who are staying in the Philippines to be prepared for the typhoon. 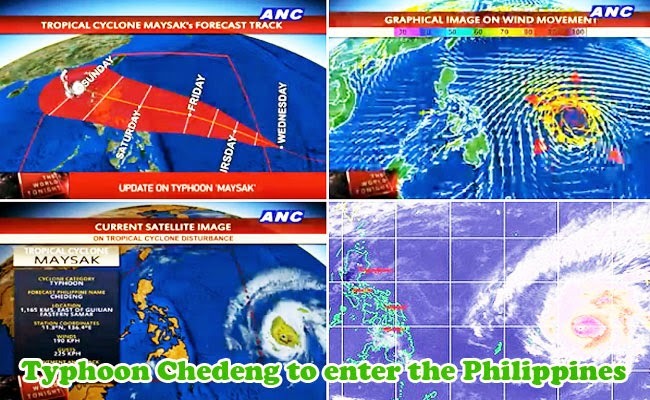 In the said statements, Chedeng is said to ne expected to pass through Luzon during weekends. On the other hand Canada says that Chedeing will be felt by April 4, 2015 and will sweep Luzon. As per PAGASA, heavy rain will start to fall on April 3, Good Friday. Canada reminds its nationals of the effects of severe typhoons and asks them to avoid the reported disaster areas.